Spring is approaching very fast and the little one will for sure need something warm and cozy to wear when it gets here. This hoodie looks adorable and is very comfortable. The pattern is easy, good for beginners and grows quickly as you stitch it. You can make it in any colour you need to match the rest of outfit and make it unique by adding a matching edge. For more free designs every day follow us on Facebook. Link to that pattern is below. 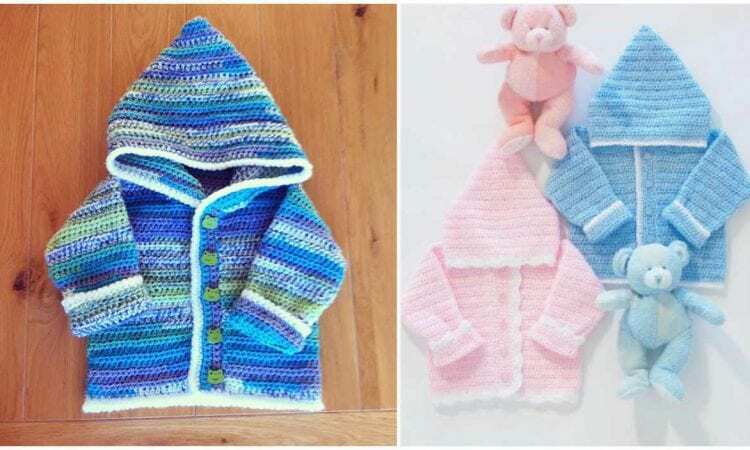 Sweet Baby Hoodie – Visit free pattern site. More details about yarn and hook you can find here and here. Me encantan los tejidos y agradezco la ayuda que me da a través de los diferentes modelos sigan adelante ayudando cada día a las mujeres que necesitamos divertirnos con estas labores.